A device that ‘scans’ images, book pages, etc. Scanning is basically taking a close-up photograph (just very slowly and with great detail). The scanned image data is passed to the computer. The most common type of scanner is the flat-bed scanner which has a glass plate on which the item to be scanned is placed. The item is illuminated and an image of it is captured by a moving scan ‘head’. Scanned images can be further processed once inside the computer, e.g.OCR of printed text. 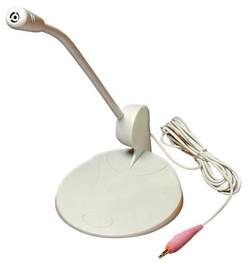 An input device that converts sound into a signal that can be fed into a computer. A device that captures digital photographs. Most digital cameras do not directly input data into a computer - they store photographs on memory cards. The photographs can later be transferredto a computer. A modern digital camera can capture 10 Megapixels or more per photograph - that’s 10,000,000 coloured dots (pixels) in every photo! A device that captures moving images, or video. Like a digital camera, most video cameras do not directly input data into a computer – the captured movies are stored on video-tape or memory cards and later transferred to a computer. However, there are some situations where video cameras do feed video data directly into a computer: television production and video-conferencing. In these situations the video data is required in real-time. This is a very basic video camera used to feed live video into a computer. The video data from a web cam is low quality compared to a full video camera. However it is good enough for web chats (e.g. using a messenger application such as MSN Messenger or Skype). 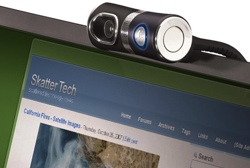 Usually a web cam is clipped to the top of a monitor, but many laptops now have web cams built into the edge of the screen.